...my new Christmas card! 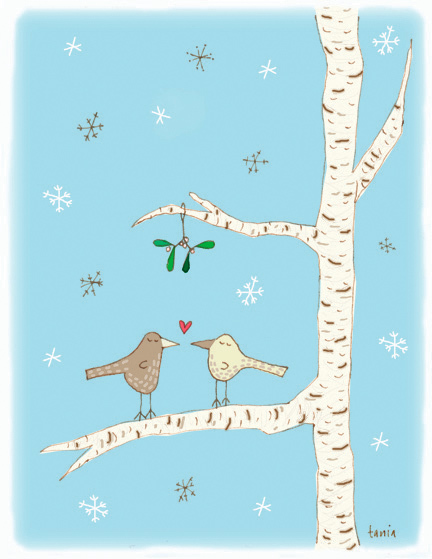 Some birdies (surprise surprise) doing some holiday beak clacking up in the tree. You can look at it or buy it here. The card is 100% recycled paper this year and the colors are slightly more muted in real life. They go for $10.00 plus shipping and you get 8 cards and envelopes. It is Friday! I didn't have to go to work today because it is Remembrance day. I know I know, we are the only company who get this day off other than government. It's awesome! Without fail every year at 11:00 when I hear those bagpipes on the radio and some guy giving a speech about the veterans who gave their lives for our freedom, I get all choked up. Especially when I think that we have not evolved at all and are still in the killing business to this day. Sad. I spent the morning vacuuming like mad - these cats shed up a sweaters worth of fluff I swear. Lunch time I got to see the baby again! My good pal came by with the sweetie and he is big now! So babyish at nearly 4 months. I got to snuggle him and make funny faces to see him laugh. I was lonesome when they went home so I lit a candle to keep me company and added my card to the shop as well as beefed up my archives page just for the heck of it. I'm just getting one of those mean red crosses! Will visit again later to see if it's back... (maybe it's shy). i can't see the card either.... ick! i so want to... i'm sure it's cute.... duh! those cards are wonderfull, I love them!!! I love this Tania, so cute! ordered mine just now!! I love them! Tania, I love your card. It is SO sweet!